One of the perks of having a blog is the fact that I have an excuse to make delicious things that normally would not or should not. Emphasis on ‘should not’. 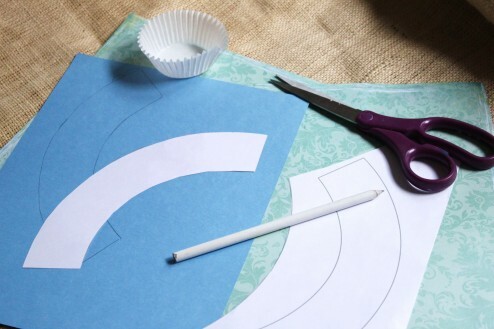 For awhile now I’ve been wanting to make my own cupcake liners, you know, the pretty ones that you place around cupcakes after you have made them. 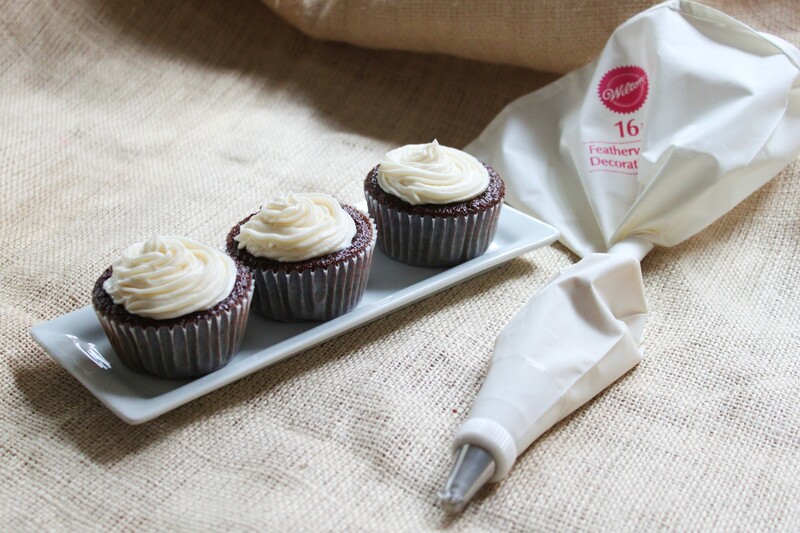 Of course you can’t fully try making liners without making cupcakes (wink, wink). 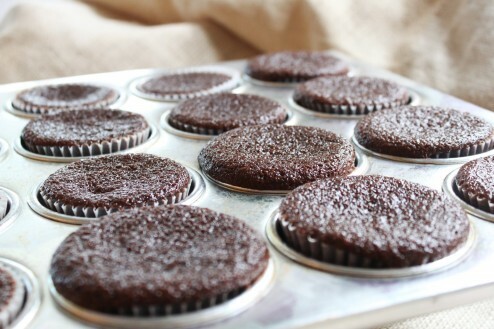 For these little guys, I used my chocolate cake recipe – easy, chocolately and oh so moist. The frosting is standard butter cream – perfectly sweet, perfectly creamy. I love finding a cake recipe that I know is going to turn out well – no guess work, no surprises. This recipe makes a lot of cupcakes, 40 or so to be exact. If you are making it for a smaller crowd just half it. I also use it to make my 3 layer cake, so that is always an option – a Chocolate Winter Wonderland Cake, I can see it now! Honestly, this is a little bit more complicated that mixing a box cake, I’m not kidding!! Fresh out of the oven. You really just want them to be just above their liners. This is the start of my cupcake liner experiment. I found a liner template online (can’t remember where) and then cut it on the blue card stock, then outlined it on my pretty paper. I cut them and folded them. I had to experiment on the cupcakes to get the right sized liner but once had a template, it was smooth sailing after that. I used my 16 inch decorating bag and just swirled the buttercream on top. 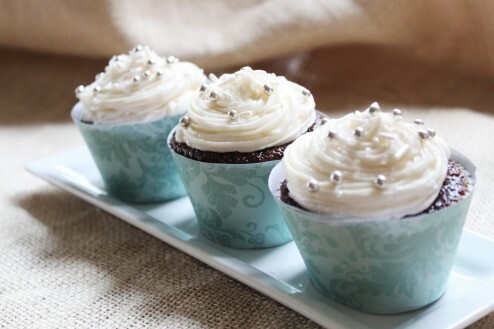 I used 2 types of sprinkles – clear sugar, silver and pearl white. Ta da! Enjoy! Line the cupcake tin with liners and lightly spray each liner with cooking spray. Sift the flour, sugar, cocoa powder, baking soda, and salt into a large bowl. Whisk to combine them well. Add the oil and sour cream and whisk to blend. Gradually stir in the coffee followed by the vinegar and vanilla. Whisk in the eggs and beat until well blended. Scrape down the sides of the bowl and be sure the batter is well mixed. 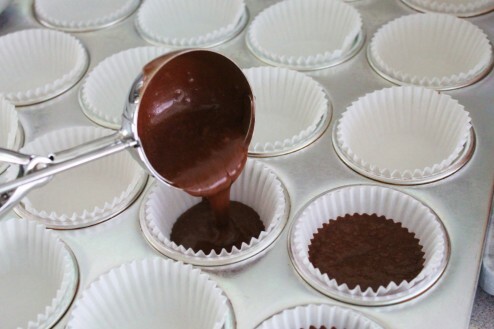 Use an ice cream scoop to scoop batter into the cupcake tins, fill ¾ of each liner with batter. Bake for 18 – 22 minutes, or until a cake tester or wooden toothpick inserted in the center comes out almost clean. Let cool in the tins for about 20 minutes. These cupcakes are super moist, so let cool completely before frosting. Beat butter for a few minutes with a mixer with the paddle attachment on medium speed, turn off. Add 3 cups of powdered sugar and turn your mixer on the lowest speed until the sugar has been incorporated with the butter.